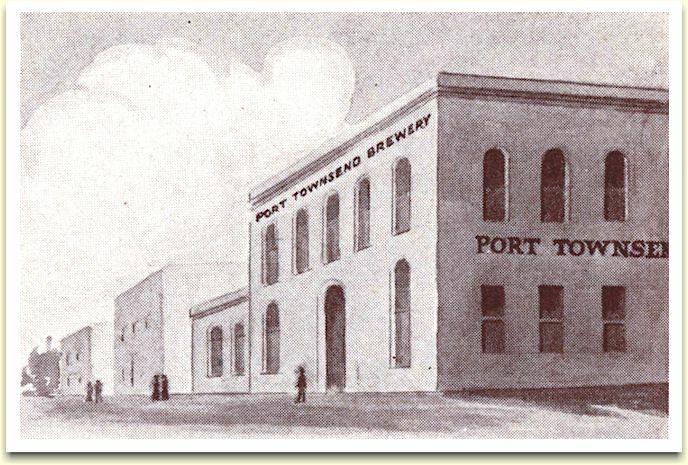 History of the Port Townsend Brewing Co. The subject this article was not the first in the city to do business under the city banner. 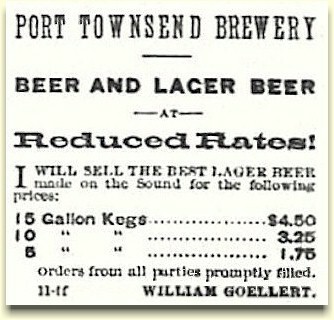 The first Port Townsend Brewery in this fledgling city was established in 1874, by a 34 year old Swede by the name of William Goellert. 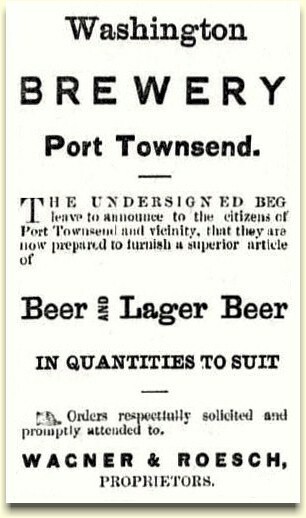 His ad in the May 1875, Weekly Argus (right) would suggest that he didn't offer his beer in bottles. In 1877, Goellert was found guilty on three of four counts of selling alcohol to the indians, which may been instrumental in his sale of the brewery the following year. Goellert then moved north to New Westminster, B.C., where he established the City Brewery. William Roesch and his partner, P. Wagner, took possesion of the property, and changed the name to the Washington Brewery, as shown on the Dec. 26, 1878, newspaper ad (below). The partnership of Wagner & Roesch lasted less than six months, when on May 15, 1879, Charles Eisenbeis purchased Wagner's controlling interest in the brewery. Eisenbeis was the owner of the Pioneer Bakery, which supplied merchant vessels with crackers and ship's bisquits (aka hardtack). He was also the city's first mayor, serving three terms. Roesch remained as brewer and even boarded with Eisenbeis, until late in 1880, when he sold out and moved to Oregon. There he starting a small brewery in Heppener, and then in 1882, he established the City Brewery in Pendleton. Eisenbeis' Washington Brewery produced draft beer in kegs, but it's not known whether he bottled any of his beer. 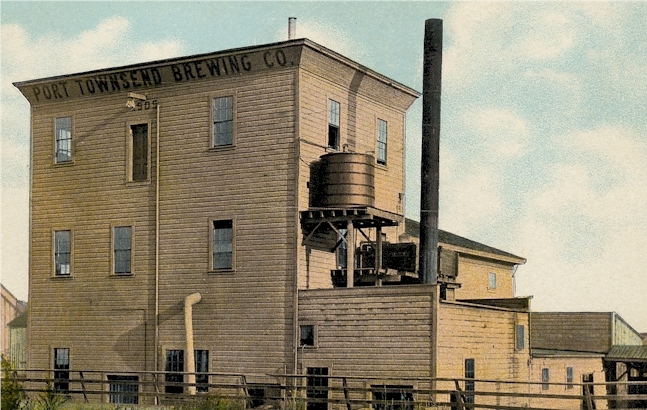 In 1888, Eisenbeis closed the brewery, and the city was to wait 17 years until it again had locally made beer. The new brewery was built by local investors George Watkins, Michael Hartman, and Newton W. O'Rear. They established the company on 5 Sept. 1905, after raising $25,000 in capital stock for the venture. The brewery was to be built on site of the old Washington Brewery. "The Old Brewery site has an old frame building on it that will have to be torn down, but the basement is of stone and is in good shape and in all probability be utilized to advantage in the construction of the new plant." "Port Townsend beer drinkers will be given an opportunity today to test the product of the new Port Townsend Company's product ­­the brew that might make the city famous." "Home-Made Beverage Finds Favor With the Public -- SPARKLING, PURE AND HEALTHFUL -- In a good cause, if such is ever permissible, citizens of Port Townsend drank beer yesterday. It was good beer, too. The extenuating feature of the occasion was the right to properly dedicate to public favor a home product - Port Townsend beer. ...The beverage sold yesterday over every bar in the city is of a character meeting the ideas of the epicure on liquid sociability. There is purity, depth and body to drink that should bring success to the makers in their efforts to claim the patronage of the public throughout this section." The article went on to report that while only draught beer is available, it's the company's intention to install bottling equipment in the near future. The principals, Michael Hartman and George Watkins, took an active role in the company, with Hartman as president, and Watkins serving as secretary/manager. Jacob Duttenhoefer, for several years chief engineer of the Olympia Brewing company, has purchased controlling interest in the Port Townsend Brewing company at Port Townsend, from George Watkins and will at once assume the management of the company. He severed his connections with the local company and left here about a week ago to close the deal. Mr. Duttenhoefer plans an immediate improvement of the plant, including an enlarged ice making plant and increased facilities permitting an increased output." As far as the public was concerned, the new owner was Jacob "Jake" Dutterhoefer. But just as in the 1903 purchase of the Salem Brewery Assn., where the deal was made by a front man for Leopold Schmidt (see biography), this too was a case where he preferred to keep his financial interests private. This acquisition fit nicely with Schmidt's multiple brewery concept, and was not intended to carry the Olympia Brewing name. Jacob Duttenhoefer, and Ernest Studerus, replaced Hartman and Watkins, with Duttenhoefer assuming the position of president/manager, and Studerus as secretary and brewmaster. However Hartmann retained an interest in the venture. Also, H. H. Morrison held the position of vice-pres./treas. for a short time, as he was also a stockholder. As Schmidt's chief engineer, Jake Duttenhoefer had also been his trouble shooter. When Schmidt was planning a brewery in Redding, Calif., Jake was the point man, and when they instead chose to go with an agent and bottling works, Jake was again sent to trouble shoot problems with the equipment and management. An added product line for the Brewery was announced on 25 January 1910, with the installation of a soda water works. The new equipment will enable them to produce "...all kinds of carbonated water, syrups, cordials, etc." "The company will also commence putting up a building for its bottling works on a lot across Monroe Street, opposite the brewery, and when this building is completed a specialty will be made of its bottled product." The following August, plant manager, Duttenhoefer had a dynamo installed for their new electric light plant. This was to provide for brewery lighting and the running of lighter electric machinery. 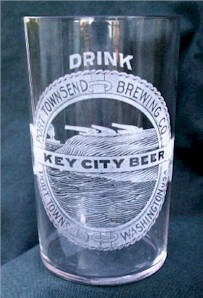 This new Olympia branch never produced Schmidt's flagship brand, "Olympia Pale Export" but continued to brew the popular "Townsend Beer" and "Key City Beer." In fact none of the other of Schmidt's plants (Bellingham, Salem, or San Francisco) had good enough water to produce "Olympia Beer." "We have been having a hazy beer for some time. Well, in fact, ever since I've been here and it seems that we cannot overcome it. I intended several times to increase the price of our beer but cannot do it on account of the haziness, as I have nothing to stand on to make the talk as to better quality and the increased cost of brewing materials. I am seriously thinking of changing brew masters. I think I could get the brew master from the Port Angeles Brewery, and I believe he is a good man from what I have seen that he has to work on and the quality of beer he produces. Of course Mr. Studerus is a stockholder in this company to the extent of $1000.00 and seems to do the best he can, but he cannot produce the goods." Duttenhoefer was successful in replacing Sturdeus with a new brew master, but not from Port Angeles. Instead, he acquired the services of Gustaf Beier. They apparently corrected their haziness problem and continued selling their draft and bottled beer. The above letter would lead one to believe that Duttenhofer would steal a competitor's brew master, but the Angeles Brewing & Malting Co. was having financial difficulties and had been in bankruptcy proceedings since April of 1910. On 18 Jan. 1911, stockholders meet and elected officers of the firm. Jacob Duttenhofer remained as president and general manager; Michael Hartman became v-p and replaced Studerus as secretary; and H. H. Morrison became treasurer. 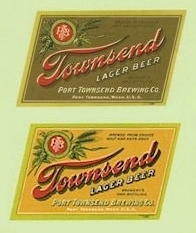 In early 1914, the Port Townsend brewery again revised their label - this time to the the one shown below. But it was short lived as state-wide Prohibition was chosen by the voters in November 1914, giving the brewers until January 1916 to sell their stock, and to discontinue the manufacture of beer. (as shown below and at right). The colors may have been to signify different brews, with the neck label identifying which one - such as a Pale Lager, or an Export Lager, etc. 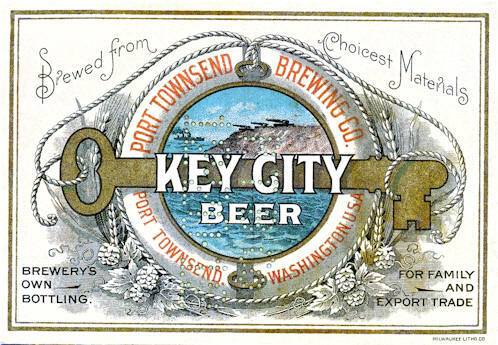 Their first label for their first bottled "Key City Beer" (below) was introduced in June of 1910. The label depicts Fort Worden's gun emplacement on the bluff with a steaming war ship in the distance. These guns were part of the "Devil's Triangle" - one of three emplacements that guarded the entrance to the Puget Sound. 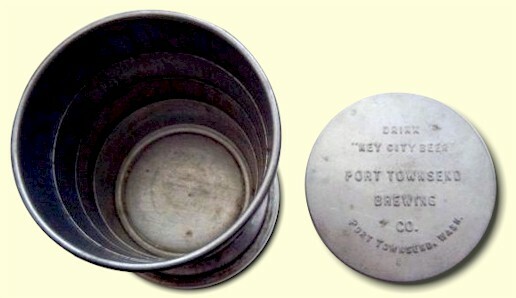 The perforations in the center of the label read: "PTBCo 12-20-12" which signifies the Port Townsend Brewing Co., December 20, 1912. 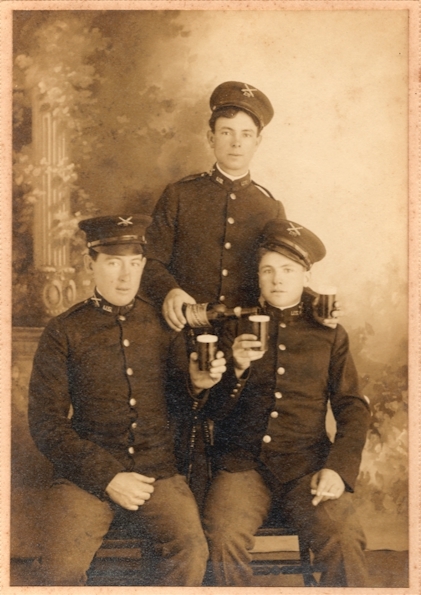 This 1914 cabinet photo depicts three young "cannoneers," who manned the huge guns on the bluff, enjoying a glass of Townsend beer. The close-up below gives a better glimpse of the label, and it appears that they are drinking from etched glasses. Founded in 1851, Port Townsend is geographically isolated at the tip of a peninsula of the Olympic Peninsula, and is surrounded on three sides by bodies of water. In the days of sailing ships, her strategic location at the entrance to Puget Sound provided an edge over other contenders further into the Sound. By the early 1880s, this small outpost was on the verge of becoming a great city. At a time when the transportation of nearly all people and goods in the Pacific Northwest depended upon sea travel, Port Townsend, was at the hub. Maritime-related enterprises fueled a flourishing economy, providing ready wealth and shaped the character of this ambitious town. Just three years after the town was founded, the Puget Sound Customs Collection District was moved to Port Townsend. This provided the town with an exceptional opportunity for prominence and prosperity. Every vessel entering Puget Sound from any foreign port had to make its first stop at Port Townsend. At this juncture, the "Key City" was born. By the 1880's construction of a grand downtown infrastructure was well underway. The downtown and uptown were connected by several staircases up the bluff, and both were served by the city's street cars. Many of its beautiful Victorian buildings were built and its population reached a peak of 7,000. Planning for the city to become a major railroad terminus, investors laid track as far south as Quilcene, but money ran out before tracks could connect to the Northern Pacific railroad. Port Townsend may have been perfectly situated for sailing ships, but steamships could proceed into Puget Sound without concern for losing the wind in the inland waterway. The loss of the Customs Office to Seattle in 1913 was a final blow to the Key City's grand ambitions. "Brewery Dismantled - All that remains in this city of the Port Townsend Brewing company's plant is the buildings and a few pieces of discarded machinery, the remainder to be shipped up-Sound. The ice making plant will be sent north to Petersburg (south of Juneau, AK) where it will be used by the cannery at that place for cold storage purposes, while the remainder of the machinery will be utilized for other purposes than making beer. The plant was one of the best equipped small plants in the Northwest. It was built and equipped under the personal supervision of Jacob Duttenhoefer, who has had considerable experience in that line of work. The dismantling of the plant recalls many pleasant memories to those who in days gone by quaffed the cool and refreshing beverage which it turned out, but will now have to content themselves with imbuing in the substitutes which look like beer, taste like beer, but do not produce the invigorating qualities of Beer." 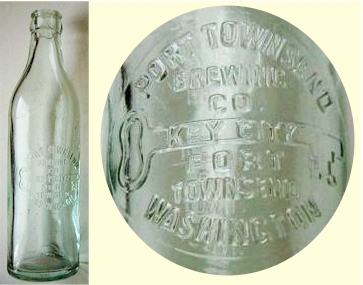 The Key City Beer label (above) would have been on the reverse side of this embossed bottle. 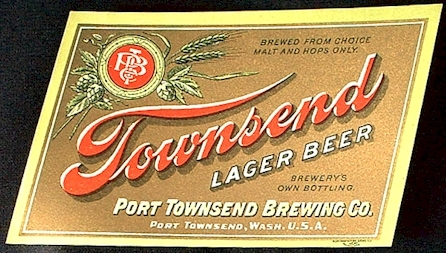 "Compliments of Port Townsend Brewing Co."
After Repeal, in April of 1933, a new brewery was erected on the original site of the Port Townsend Brewery and operated as the Peninsula Brewery, but not as a holding of the Olympia Brewing Co. The new corporation did not issue a public stock offering. The $15,000 capital expenditure was initially financed by a two officials of the Brewery Engineering Corp. of Seattle which designs and manufactures "Germania Process" equipment for such plants. The newly formed company purchased the old brewery from William J. Buhler and John J. Lafferty. "The entire storage capacity of the brewery, 1800 barrels, is now practically ready for delivery, and the arrival of the entire stock of kegs will see much activity in the local plant. More than the present output has been spoken for in local and export sources." In spite of this optimistic outlook, and additional capital stock being issued, the brewery shut down in early 1935. 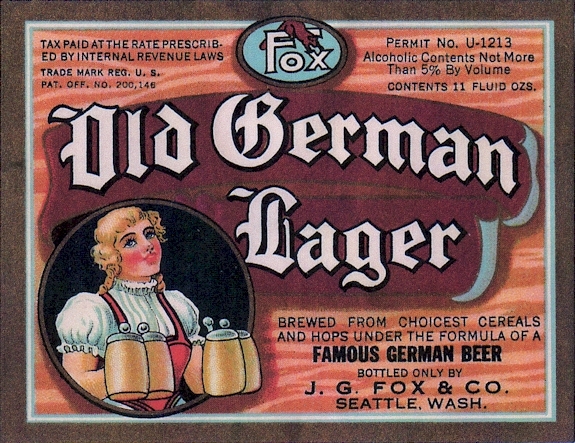 The label (right) for Old German Lager was made for the J. G. Fox & Company of Seattle, c.1934. Fox was a distributor, and bottler of soda and beer. Before Prohibition he had been secretary of the Seattle Brewing and Malting Co., and now was a stockholder in the Peninsula Brewing Company. The label bears a permit number that identifies the Peninsula Brewing Co. as the manufacturer of this beer. These numbers were issued to brewers by the U.S. Government following prohibition as a method of licensing. The numbers were required to be on all product labels from 1933 until September of 1935. The Brewery was assigned "WASH-U-1213" and this number would have been on all of their labels, including kegs. The addition of a bottling department was planned, however draught beer was all that they ever produced at the plant. It is not yet know if the brewery ever contracted with the Fox & Co. to bottle their beer with Peninsula Beer labels. The Buhler family still owns the old Peninsula Brewery building, which is now home to the Port Townsend Athletic Club. The device shown here was found in 1986 by the new owners of Aldrich's Grocery Store in Port Townsend. 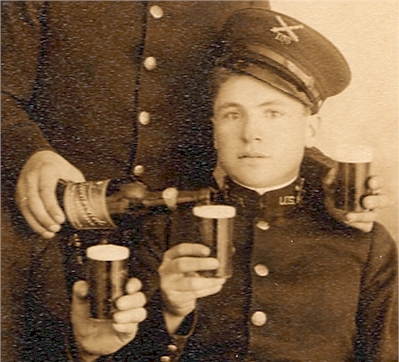 Ben Aldrich was a Peninsula Brewery stock-holder and no doubt offered beer off-sale from his premises. 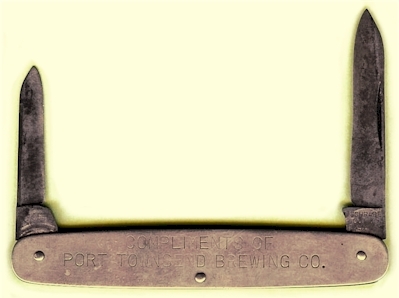 The front is embossed: "PENINSULA BREWERY / PORT TOWNSEND WASHINGTON / PERMIT NO. WASH - U - 1213. It's only 16" high, and is stamped on the reverse: Serv-O-Draft / Manufactured by / Serv-O-Draft Corp. / Detroit, Mich. / 3⅞ gal. - 1934." This capacity equals ⅛ barrel. When I obtained the device I wasn't sure exactly what it was, but with the help of ABA members I've discovered what and how this piece of equipment was used. This is a portable draft beer dispenser (called a Growler - at least by the Leisy Brewing Co.) and was intended for off-sales use. The filling and dispensing fittings are under the protective, red bell housing. 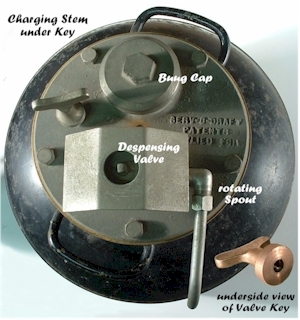 The key, shown in its stowed position, protected the valve stem through which the unit was pressurized. This same key had a square cut out, which allowed it to also be used to open the dispensing valve. A separate view of the key's base is shown in the lower right corner of the image. The spigot is shown in the dispensing position, but when stowed it would rotating 180° to allow the bell housing to be screwed in place. 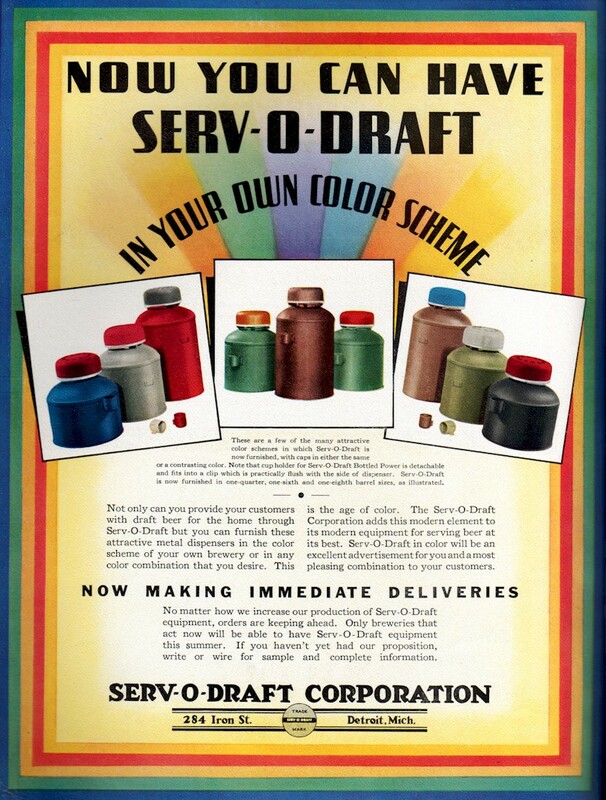 The Serv-O-Draft Corporation also offered these dispensers in 7¾ gal. and 5⅞ gal. capacities. These devices were popular with breweries in Detroit, and nearby areas. The ones I have been made aware of are the Tivoli and Pfeiffer Brewing Companies of Detroit, and the Gipps Brewing Corp. of Peoria. The dispensers were available in a wide variety of colors and finishes with caps of the same or contrasting colors, so breweries could have their own color combinations. Serv-O-Draft had a Detroit competitor for these dispensers called "Acme Containers" which were produced by Miller-Shelby Products of Detroit. The body looked like a stubby milk can (handles on the shoulder), and the top plate and fittings appear to be bronze. Also there was no threaded filling cap, but rather a flared opening which would have required a wooden bung. 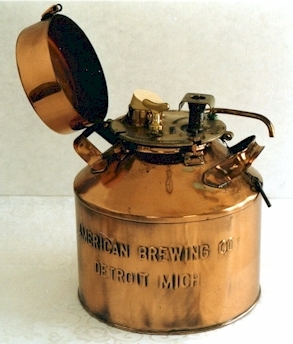 One example of the Miller-Shelby units, made for the American Brewing Co. of Detroit, shown here is impressive with its copper plated body. They dubbed their dispensers a Parlor Bar. Another Acme Container, made for the Leisy Brewing Co. of Cleveland, has the brewery's name embossed on one side of the silver painted, steel body. In addition, this device has LEISY'S painted on the shoulder and "GROWLER / The life of the Party" - painted on the side. Other than the Peninsula, the only other draft dispenser I have yet to discover from the West Coast is a 7¾ gal. Serv-O-Draft from the Pioneer Brewing Co. of Aberdeen, WA. I believe that the reason so few of these survived was due to the scrap metal drives during WWII, and the shift to half-gallon glass jugs like those used by the Globe Brewing Co. of SF. Special thanks to Bryan Anderson for sharing the Key City labels and the image of the Brewery. And to John Cartwright for images of the embossed bottle, collapsible cup, and the pocket knife. Also thanks to George Zurava for the advertisement, and information on the Leisy Growler. Cabinet photo of the cannoneers courtesy of John Boertlein.